Losing your job can be one of the most traumatic experiences of your work life. The good news is that, even though redundancy can be traumatic, it’s also a great opportunity for a new start. Your most valuable asset as a Job Hunter is your time, so don’t waste it! Finding the right jobs to apply for can get frustrating. A big part of this is because most job ads are poorly written and can be a nightmare to decode. So, I’ve put together 11 useful tips to decode job ads, so you can secure your job interviews faster for jobs you deserve. Here is some simple HELP so you can start to figure out what different terms mean in job listings, and you figure out which parts of a job listing are actually important, and which parts don’t really hold much weight. 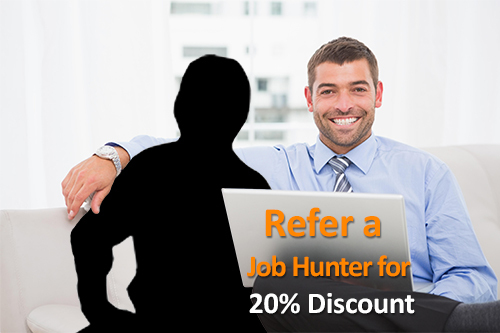 Most job hunters search for the title, location and the $$$ first and then create a shortlist. Once you have your shortlist, start to review each job ad from the bottom – up. Read the submission instructions and if they fail to clarify how they want you to submit and who to, move on. 75% of all job applications are discarded by ATS software. Your chances get even slimmer if you apply for jobs with companies who fail to provide decent instructions and human interaction. Enough said. In most job ads, the buzzwords and catchphrases really don’t mean much. This is because the person actually writing the job ad often doesn’t know much about the job or because the job listing has been taken straight from a template. In that case, try to decipher them as best you can, and then apply. A lot of job titles won’t include terms like “junior” or “senior”. In that case, they probably fall somewhere in between junior and senior, unless words like “management” or “head” are included in the description. If a job is listed as a senior position, they likely want someone with at least 3-5 years of experience (and sometimes much more), and probably someone with some management experience. Senior positions are usually in charge of a team. Junior positions, on the other hand, are entry-level or maybe have a couple years of experience, and often work closely with other team members. A fast-paced environment isn’t necessarily a bad thing, if that’s how you like to work. Personally, I thrive under deadlines and get more done in less time when I have a lot on my plate. But not everyone is like that, and if you’re not, you should probably avoid applying for jobs with this kind of keyword in the title. It’s a clear indication of a fairly high stress situation. “Growth opportunity” might indicate a few things, but it often means your responsibilities and tasks will expand over time. It can also mean that there’s some opportunity for advancement. A common thing “growth opportunity” tends to hide is a lower starting salary. That’s not always the case, but it can definitely be an indicator, especially at a start-up business. Flexible jobs are sometimes remote, and remote jobs are often flexible, but the two terms are not entirely interchangeable. Flexible usually means that you have a high level of control over your hours, and that you may be able to work from home at least some of the time. Remote means that you can work from home (or elsewhere outside of a central office) most or all of the time. A lot of most of the innocuous job description terms can actually be potential red flags. “Detail-oriented” might translate to expecting perfection, or flag a control freak of a boss. “Team player” could mean that you’ll be at the bottom of the totem pole for tasks that no one else wants to do. “Self-starter” usually means that they have no idea what they need you to do and/or that your induction and supervision will be minimal, and you have to figure it out based on vague descriptions of what they think they need. Job titles can be one of the most confusing parts of a job listing. Job titles may be created to appeal to the widest number of potential applicants possible. 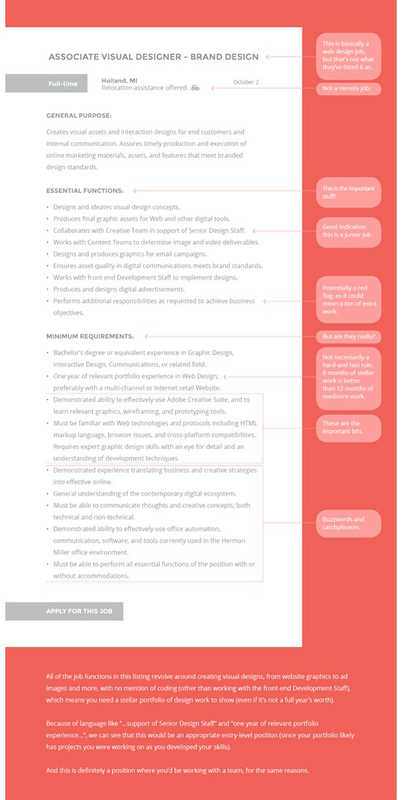 “Web designer” might sound too generic to some applicants, but UI or UX designer makes it sound like a more advanced or exciting job, and so those writing the job listings may opt to use those terms. The other thing you’ll likely see with job listings, especially in the tech & start-up world, is funky titles like “rockstar”, “hero”, “ninja” and the like. Job titles like “Front-end Rockstar” don’t really tell you what you need to know about the job requirements. You’ll need to read the job requirements with a lot of attention to the detail to figure it out. This is usually the most important section of the job ad listing. Hopefully, this has been written by someone who’s actually familiar with the specific job at the specific company, and not just taken from a template site. Either way, consider each item on the responsibilities list and honestly consider whether you can meet those responsibilities immediately or in the near future. Really ask yourself if you want to spend your valuable time submitting an application if you can’t answer these key responsibilities with at least a 70%:30% yes to no ratio. If you’re below that, move on to your next job ad. First things first: job “requirements” aren’t really requirements. Thousands of job ads out there have taken the “requirements” from a template, rather than from the hiring manager’s actual needs. Add to this that all too often the job descriptions are written by people who don’t actually know everything they need to about the job. So, don’t obsess over the job requirements and stress out about all the ways you don’t match up. Instead look at the responsibilities of the job, and see if your skills and past experience are in line with them. Then, when you actually apply, highlight your skills and experience, and downplay wherever you don’t meet the “requirements”. Finally Tip # 11 – What kind of company is right for you? Companies of virtually every size and type need employees with skills. But, there’s a big difference between working for an established company outside of the industry you know, an established company in your industry, a start-up, or an agency, to name just a few. Established companies often have more stringent and rigorous hiring standards and procedures than start-ups do. They might also attract more applicants, simply because of name recognition. That means competition will be tough, and they may be looking for any reason not to hire you, rather than reasons to hire you. Here’s an example to demonstrate some of what I’ve outlined above. Contrary to many job seekers’ fears, job ads are more likely to be wish lists than demands. In addition, it’s often hard to tell what these companies are actually wishing for. Whilst I always recommend networking and referrals as the best way to find your next job, if you still decide to search and apply the traditional way, fine tune your radar with our decoder and always remember to hunt wisely! As a career coach and regular writer on job search issues, I receive a lot of emails from job hunters with questions about every aspect of their professional lives and aspirations.